Youngblood is the premier luxury mineral cosmetics line made of natural, finely ground minerals from the earth — without any of the common irritants (including chemicals, dyes and preservatives) found in conventional makeup. Created by former medical aesthetician, Pauline Youngblood, many of the products contain a signature mineral blend of Malachite, Rhodolite, Hematite and Zincite to help protect cells and tissue. 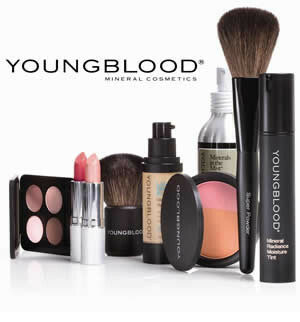 Salon Olivia carries a full line of Youngblood cosmetics available for your purchase. Our Make Up Artist is on site daily and would be happy to help you find the right shades for your special skin tone. Make up tutorials are available by appointment. •Dewy, natural skin-like finish: Minimizes the appearance of pores, fine lines and wrinkles, and leaves skin more hydrated, youthful and healthy-looking. •Weightless, buildable coverage: Customize your desired level of coverage- from sheer to medium or full coverage.